Caving. 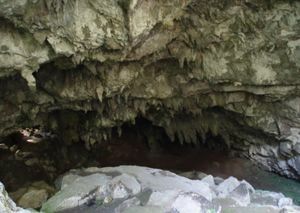 A 2-3 hour cave connection trip including a visit of the Sumaguing Cave, the burial cave / Lumiang Cave and the hanging coffins goes for ₱800 for 1st person, ₱400 for an additional person. The group goes in from Burial Cave and comes out from Sumaging cave. Book at the tourist information counter. Prepare to get wet and ziplock all the belongings. You will have to swim at least 10m to get across one portion. Normal caving costs 500P for a group of 1-4 person, ₱500 for a group of 5, other changers for a larger group. 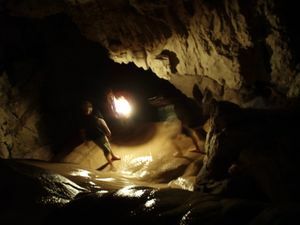 *Please note that the main attraction, the featured "cave connection," is a rather extreme activity. If you are overweight or out of shape, you will most likely not enjoy this and/or not be able to complete this. Some of the crevices you go through are just too small. The guides are very helpful and knowledgeable, but they are your only real safety net, as you are hanging on the walls with steep drops beneath you throughout the tour. A good alternative would be to do the "other" cave tour, not the main "cave connection." That being said, if you are up for adventure, you will definitely enjoy this. 95% of the people will just go down and up the Sumaguing cave and only 5% will attempt the cave connection. So the cave connection is not the "main" activity. It's hard to do and midway it's pretty sure you'll regret putting yourself in this life threatening situation. Go to bokong falls first climb to the high rock over the waterfall and jump. If you think that was easy you're ready for the cave connection. Hiking Bumud-ok Falls (Big Falls). Take a jeep near the Municipio, one heading for Bangaan. Fare is ₱15. You do not need a guide to go to the big falls. It has a well-established path. Make sure to try jumping from the ledge. Rock Climbing, Near Echo Valley. It only costs P400 per person inclusive of all gears and guide fee. No time limit. White Water Rafting, . White Water rafting is available on the Upper Chico River, typically from July to early January, but that may vary slightly with rainfall. The sections of the river being rafted are downstream from Bontoc, except in unusually high water when rafting above Bontoc is possible. Most sections have numerous class 3 to 3+ rapids and several class 4 rapids. Equipment is international standard and guides are trained by US rafting professionals. Cost ranges from 2500 to 3500 pesos/person depending on group size and section being rafted. Inquire at Sagada Outdoors, in the white commercial building across from the jeepney stop. Sunrise at Kiltepan Peak. It is worth getting up early and get to the mountain from which you have an outstanding view through the entire valley. Cloud formations change every minute as the sun crawls to the top of the mountains, allowing for marvelous views. You can walk there from town or get in by car, use road next to Petron petrol station (SUV required) to get to the parking area on top. Food stalls offer coffee and all types of fresh local breakfast options. Sagada Weaving (Sagada Weaving and Souvenir Shop), Nangonogan, Poblacion, Sagada (10 minutes walk from the center of the town towards the direction of St. Theodore's Hospital), . -- Store for local and handwoven products are one of the more popular souvenir shops in Sagada. It is one of Sagada's biggest employers and one can visit the weaving looms to view how intricate the weavers go about in producing the handwoven raw materials. Very affordable prices too. Yoghurt House (Bolkana House), Dagdag (Go down the main road from the municipal hall). The Yoghurt house at the boundary of Poblacion and Dagdag is a popular and restaurant serving meals from breakfast to dinner. Specialities include varied yoghurt dishes and fresh local produce. Sagada Brew (Sagada Brew), Dagdag (On the same street as Yoghurt House but a bit further down from the city center. Go down the main road from the municipal hall. ), ☎ 0998-9886257. A new (Oct. 30, 2013 start) restaurant that offers good coffee; exceptional food and desserts; friendly and welcoming owners and staff. ₱40-200. Shamrock café. (formerly Bilig Café) Located at the basement of the municipal hall. If you are facing that hall, look for stairs at the side of the building. The cafe has excellent rice meals, pancakes, fantastic coffee, and more. Check out the cool postcards on the ceiling. ₱40-120. Salt&Pepper, Dagdag, Sagada, Mountain Province (On the main road down the municipal hall), ☎ +63 908 177 4972. The restaurant has good vegetarian options, Filipino specialties and picnic baskets to take out for a hike! The friendly staff also take orders for late dinner (beyond the curfew hour) and early (before 06:00) breakfast or packed meal. Wi-Fi also available. The restaurant also offers tour meal packages for a cheaper price. Contact the number above for inquiries. St. Joe's Cafe. Attached to St. Joseph's Resthouse. Inconsistent food, but the sizzling plates are quite good, and the building feels like a ski lodge. Bana Cafe. Green building which serves native coffee and excellent breakfasts on a ledge overlooking Sagada valley. on the left hand side of the main road, before the Yogurt House. Sagada Lemon Pie House, Atey, Daoangan, Sagada (Just go down the road from the Municipal Hall, passing the road where other famous eats (Masferre, Yoghurt House) are located. ), ☎ (63) 907-7820360, . Serves great tasting Lemon Pie, Blueberry Pie, Egg pie. At the ground floor is their dining area which also serves meals like the silogs. The Log Cabin, Sagada Besao Road | Poblacion Ato, Sagada, Luzon 2619, Philippines (Head up the hill from the main bus stop and less than five minutes later, the Log Cabin will be on your right. ), ☎ +63 915 671 7949. 6:00 PM-9:00 PM. Sizable portions, actually palatable food, fair price for what you get. Vegetable options abound with healthy choices of meat involved. Don't write it off for being Westernized - even the locals frequent here all the time! Homey atmosphere with free water (but no dessert). Make sure you reserve/order one day in advance for a spot, otherwise they'll be so packed that you won't get a seat! This also expedites the process of having your food ready upon arrival. $$-$$$. Slabhouse Cafe, South Road (Walk down the main junction hill for five minutes and look to your right. There's some steps up to a wooden establishment with a white on brown banner that says Now Open, Slabhouse Cafe.). 11:00 AM-9:00 PM. Super fair prices for Filipino food. Sizable servings with an added bonus that you can ask for less oil/butter in your food. Very friendly staff and fairly new business (as of May 2017). $-$$. Kimchi Restaurant and Bar. Right in the center of town, when most of the places close down, and the lights go out, this is the only place still open late into the night. Nice music. They close up when people stop drinking. Pinikpikan Haus, Across from Indigenous Handicrafts (From the market square with the police station on your left and Ganduyan Museum on your right turn left 150 m downhill past Masferre Country Inn on the left side and George's Guesthouse on the right side. It's on the left side of the street.), . Specializing in the Sagada special - Pinikpikan, the Pinikpikan Haus offers other dishes for breakfast/lunch/dinner and world-class hospitality. Masferre Country Inn and Restaurant. Masferre Country Inn and restaurant offers hotel-like amenities including a full service restaurant. It also houses the world-renowned photographs of the father Philippine photography, Eduardo Masferre. Residential Lodge. Various rooms, no dormitory. Cooking facilities, Free coffee & hot or cold water, hot shower, wifi included, lots of info on local area. good views. ₱250. Yellow House Sagada, (in front of Youghurt House), ☎ +63 947 835 1985. wifi, hot shower, souveirs shop, cooking service, restaurant with philippine cusine, motorbike for rent. ₱250 common bathroom, ₱300 private bathroom, ₱400 whole house per person. Alibama Inn & Restobar (Pinikpikan Haus (restaurant)), Across the street from (Facing the market and walking towards the church then police station (both on left side) turn left (downhill) on the main road for about 200 m. Located on the left side across from the Italian pizza/pasta store. When walking from the market you'll pass SAGGAS guide station on the right, Yoghurt House on the right, and George's Inn shortly before coming upon the Inn), ☎ +63 920 813 5797, . checkin: Proprietor:; checkout: Graal M. Bayang. Alibama Inn is a small budget Inn located above the Pinikpikan (famous Sagada cuisine) featuring single, double, and 4 person dorm rooms. Prices from ₱250 shared showers/bathrooms. Buckets of hot water available. Allan, the husband of friendly Proprietor Graal M. Bayang, can help you with all your Sagada tour needs! 250 PHP. Davey's Inn and Restaurant. checkout: 11:30am. The restaurant serve some good food too. If you plan to come back late (meaning after 22:00), just tell the owners before. (Formerly known as Alfredo's Cabin.) 500PHP for a double bed with share bathroom, but hot water. Wi-Fi available..
Travellers inn, Sagada (opposite salt and Pepper). guest house with self catering kitchen. 250-300 for a single, 500 for a double.